Discussion in 'Other Brands' started by papichino, Dec 27, 2018. This is the second year of Mitchell's adidas contract. Harden was with Nike before adidas and it be interesting if he renewed with Nike.. Would PG13 and Giannis get signatures too? The real Loser of this all is Andrew Wiggins. Before coming to the league he was supposed to be the $200M adidas man. Not only did he not get a signature Adidas didn't renew his contact lol. I don't hate it. I like the subtle three stripes on the outside. I didn't realize he was getting a sig. I guess it's because he's a guard, but his second year? That's almost Lebron territory. He's getting a sig before Brow and Giannis with Nike, and he plays in Utah. Not sure if it's good they're relying on players in Portland and Utah. 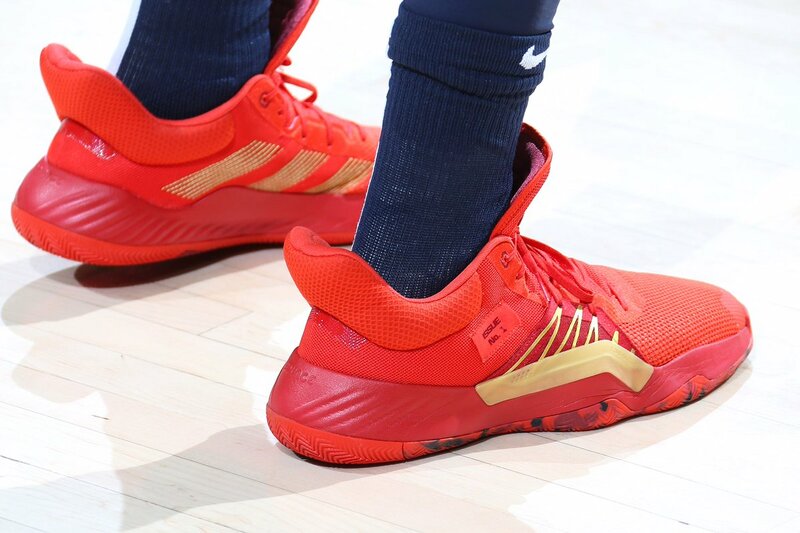 IMO they should concentrate more on making Harden's kicks visually appealing. They're blowing it. the heel cushion is definitely weird, i get it that it's what the current adidas bball line-ups aesthetic is but it just seems to add weight than serve any purpose, it owuld mak emore sense if it when up like a high top instead of flaring out unless mitchell just needs/wants a gigantic super cushioned pull tab? so glad his logo isn't just his initials. that's so tired. Shoes are pretty nice actually. Better than Hardens stuff. Pretty sure he's always been wearing these in games. I'm under the impression that the issue one is a prototype that he's not going to wear in games until later in the year or next. He's only worn the new ones on warm-up (I believe). Those are not good looking shoes. That was a big swing and a miss. They would look a lot better if the heel tab wasn't so prominent. Looks like they reduced the size of the heel tab/collar area. Looks cleaner now. gimmedatt and moneymike9 like this. Looks like a completely different shoe in that colorway. need a solid colorway though..
ripcitythree and shaneomac13 like this. Yeah the heel collar looks better now than the early pairs. Can't wait now.